Next season will be the Bowie Baysox 20th in existence. 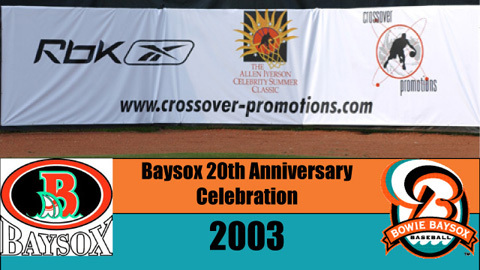 To celebrate the team's milestone anniversary, the Baysox will be counting down the 20 weeks prior to Opening Day 2012 and honoring a new season each week starting with the inaugural season in 1993. Bowie is still searching for its first Eastern League championship, but has achieved many impressive accomplishments throughout the years that will be highlighted during the coming months. Be sure to check back each week until the season starts for a fresh taste of Bowie Baysox history. Manager Dave Trembley brought his reputation as one of the best managers in Minor League baseball and the Baysox improved dramatically from 2002. The Baysox finished 69-72, in 4th place in the Southern Division after finishing no better than fifth three years in a row. On May 20, Matt Riley set a new team record when he won his 21st game with the Baysox. He holds the career record with 24 total wins for the Baysox over four seasons. He also holds the career record for most strikeouts (375) in club history. During the 2003 season, Riley pitched a complete game one-hitter against New Britain. Second baseman Mike Fontenot emerged as a top prospect with a breakout season batting .325 with 12 HR and 66 RBI. He led the team in batting average, hits (146), RBIs, doubles (24) and extra-base hits (41). Fontenot was also named to the Eastern League season-end All-Star team and was also named the Orioles Minor League Player of the Year. He also became one of three Baysox players to ever hit for the cycle when he achieved the feat August 22 against Altoona and he was named the Eastern League Player of the Month June of that season. The Baysox hosted the first annual Allen Iverson Celebrity Softball Classic July 19, 2003. The event, played at Prince George's Stadium, raised money for Iverson's CrossOver Foundation and the Boys & Girls Clubs. Baysox Baseball - We'll Knock Your 'Sox Off. The Baysox open their 20th season at Prince George's Stadium Thursday, April 5 against the Harrisburg Senators at 7:05 p.m. To keep up with Baysox news during the offseason, follow the Baysox on Facebook at www.facebook.com/BowieBaysox or visit www.baysox.com.